So, I keep seeing the Laurel Mountain Mustang Super Suspension Kit on eBay while looking for other 'vintage' parts and now I have a few questions. 1. How 'level' does a stock Mach 1 look from profile with a fresh 'stock' suspension? 2. How much of a difference is there between the 1.5" lift springs (rear) and the 5-leaf pack? (I'm thinking the 5-leaf pack will help keep the ride height, and the 1.5" lift springs will sag after awhile). 3. Are the 1" drop (front springs) worth it, or do they make the front end too low? Does anybody have (or know of) some pictures of a Fastback (Mach 1) with the 1" drop front and 1.5" rear lift with say, 60-series BFGs on 15" wheels (or equivalent). I'm asking because I'm getting close to the point of swapping out the front clip and have to bolt 'something' back on to keep the car rolling (the Auto Hobby Shop needs its lifts open if I'm not actually working on the car, and I can usually only hit it on weekends). I'm having a tough time deciding on the suspension kit because I do not want this car to be a 'tail dragger' like most of the 'stock' muscle cars from the era. But, I don't want too much rake, either. My first thought is the 1" drop front, and 5-leaf rear springs. I'm not looking for crazy performance suspension or anything - just wanting to get the car back on its wheels with the permanent suspension package under there the first time. Thanks in advance for any and all advice offered. Oh yeah - I'm hoping my car's going to look a lot like Nance's car, only with the rear wheels not out quite as wide. Otherwise, very similar. We were going to go with the Super Suspension Kit from Laurel Mt on the 72 Coupe, but we decided to go with a Rod and Custom Mustang II type system. It has 11" discs, rack & Pinion plus user adjustable height! I have the 5 leaf but not Installed yet.Waiting on warmer weather.I just installed front springs this past fall.Going to change the wheels also cant stop the cragers from rusting. 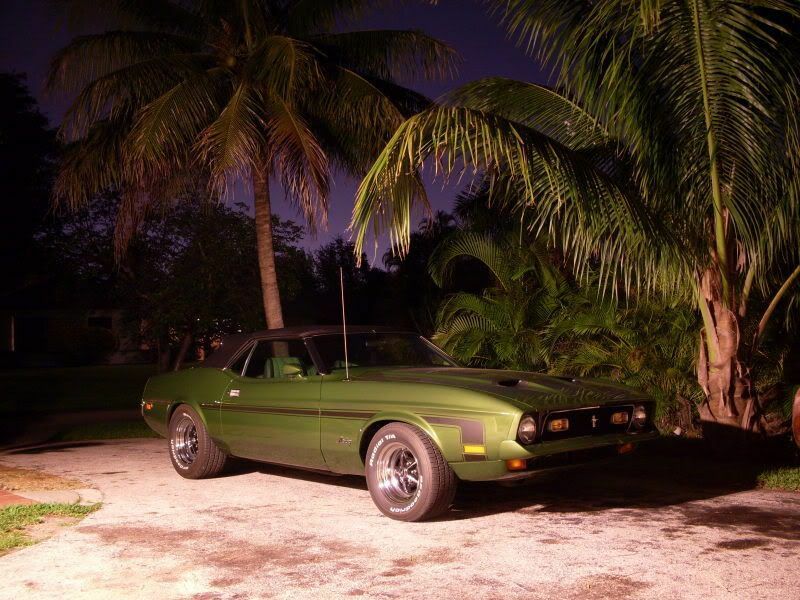 Look at 71mach1 car .look how it sits that what I am trying to do. Although not a fastback, mine is a completely stock original suspension stance, with about 85,000 miles on it. I know mine is not a Mach 1, but thought I'd offer my experience anyway. Not to try and stop you from buying from Laurel Mountain but I had a BAD experience with them in the past. I bought a chrome trim piece for my hood and it took about four months to get it and when it finally came, it was damaged. Just sayin'. Thanks everybody (yes... you too, Doc ) for your input. One reason I was hot on the LMM kit was because I found it on eBay at a somewhat reduced price from the listed price on their site. And also because, well, Ohio Mustang and CJ Pony don't offer complete front and rear kits all-in-one... or at least, not that they're advertising. I also haven't priced out the kits they do have to see if it would work out the same, more, or less. Knowing that others have had issues with LMM's shipping and back-order, I'm even more inclined to just stick with Don and go from there. Kinda seems like one of those cases where it's too good to be true [LMM], I suppose. I guess technically, I can go with a front kit while I'm working on the front clip, then get a rear kit when it's time to work on the back end (still don't know if I'm going to be replacing rear frame rails or not along with the trunk sheet metal, as 72HCODE suggested I should be prepared to do). (12-28-2010, 07:12 PM)Mister 4x4 Wrote: Thanks everybody (yes... you too, Doc ) for your input. What I like about Don and OMS is that if its not in stock you cant order it. Not like some parts houses that I have dealt with in the past, and I won't mention which one but they do reside in the great state of Texas. (12-27-2010, 02:15 PM)Mister 4x4 Wrote: So, I keep seeing the Laurel Mountain Mustang Super Suspension Kit on eBay while looking for other 'vintage' parts and now I have a few questions. I looked at the LMM kit & what I'm seeing is New STOCK components with upgraded sway bars & kyb shocks. Unless you cut the front springs your not gonna get any drop with that kit. The sot kit is fully adjustable for drop.